Plate steel ‘A’ frame: Plate steel offers greater strength from natural force applied downward from tractor top link. Tubular Construction: 2 1/2” x 2 1/2” x 3/16” Tubing vs. angle iron offers greater strength as well as gives a better appearance. Expanded metal in weight tray: Adds safety over spoon area, doesn’t allow foreign weight object to fall into spoon area, keeps cores from being thrown forward. Hardened steel spoons: 3/4” ID spoons, with 3 mm wall thickness and beveled edge penetrate the ground easier than thicker OD spoons, but are just as strong. Individual Spoon Replacement: Requires removal of only two bolts to replace a worn-out spoon. Don’t have to disassemble the whole rotary section to get to the spoons. 5 1/2” Gang spacing on 60” unit; 6 1/2” Gang spacing on 72” units: 5 1/2” on 60” Units, 6 1/2” on 72” unit offers optimum core pulling pattern. Spoon gangs: Spoon gangs are independent of each other allowing for less side load torque on each gang and tearing of the turf during turns. Spoon gang greasing: Each gang has a grease zerk for smooth rotation. Storage stands: Each corner has a storage stand to aid in off the ground storing, as well as aiding in hooking to the tractor. 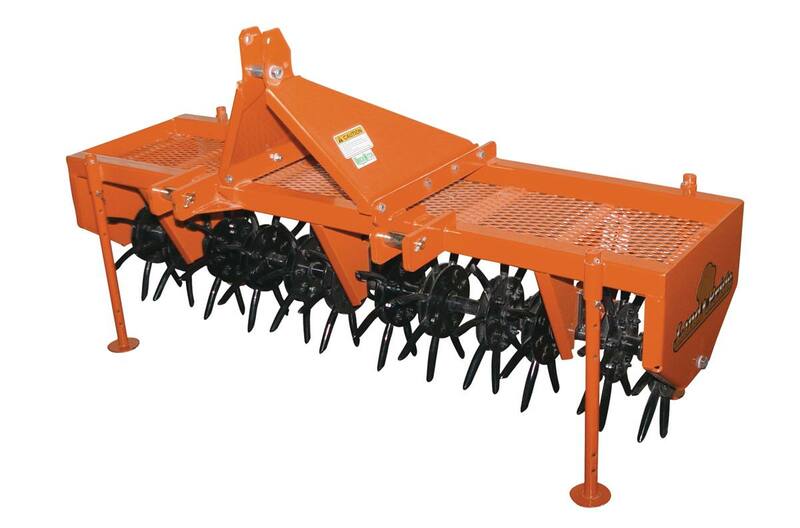 Spoon spacing – forward travel: 7” Spacing in forward travel offers optimum aeration. Sq. foot aeration: 4 Cores per sq. ft. on 72” unit, and 6 cores per sq. ft. on 60”. Optional Water Tanks: Easily add up to 490 lbs. to the 60” and 600 lbs. to the 72” to aid in compacted soil conditions. Can easily reduce weight by draining tank incrementally. Water tanks are safer due to precise fit and fastening vs. stacking inconsistent sized objects and difficulty in uniform fastening. 2 Sizes 60" & 72": Great sizes for small landscapers to golf courses, campuses, cities. Overall Width: 68 3/4 in. Overall Length: 30 1/4 in. Overall Height (With support stands up): 42 in. Weight (w/o added weight): 464 lb. Spoon Material: 3/4 in. Closed case hardened Replaceable. Spoon Spacing in forward travel: 7 in. Spoon Penetration: 4 1/2 in. Depending on ground conditions and added weight. Gang Spacing: 5 1/2 in. Frame Construction: Tubing 2 1/2 in. x 2 1/2 in. x 3/16 in.